Aelva’s personal performance group. They put on a good show at Fantasy Faire the other day, so if you’re up late, catch this one. Debauche once again join forces with the amazing Oasis Dancers this time playing host in our own lovely home theatre. This promises to be another amazing, magical show with two great dance troupes sharing a stage together. We LOVE it. Oasis LOVE it. You will too. The event is hosted in voice and takes place at the Inanna Burlesque Club in Somerton featuring the Inanna Angels Dance Troupe, seven ladies and three very happy guys! The event also features a number of solo dancers/choreographers from across the grid all performing in the spirit of Burlesque. Please join us, as Dancing Desires Dance Troupe takes to the stage in their beautiful home theater. A variety of dances that will showcase everything from fun and exciting to emotional and loving as some of the best choreographers across the grid bring their slice of dancing to the stage! We have a very special finale to share with you this month. We look forward to seeing you in our audience. Ballet Pixelle® will open its production of “Avatara” on Sunday, April 15 at 5:00 pm SLT, Join us for this original composition of virtual dance! What if a real world dancer could dance in a virtual world? What movements would be the same or different? What kinds of different beings could she be? What would be the same? And how would that dancer be changed after her experience? Performances are Wednesdays at 5:00 pm and Sundays at 5:00 pm SLT throughout April in the Ballet Pixelle Theatre. Audience dancing at the after-show party every performance! Join us for an evening of delights. Chat with the performers and crew after the performance for autographs, photos, and a question & answer session. Formal dress expected. If you haven’t seen this yet, there’s multiple shows through the run on Sundays and Wednesdays, and it’s different from the usual stage acts. Very quirky and Dadaesque. I caught them earlier in the month, and it was a very colourful and racy show that I enjoyed. I didn’t manage to see the final two acts, so I’ll swing by and catch them before it’s time to see Mistletoe’s return fireworks show at Toot Toot’s. There’s been a few questions and issues as of late, so I thought I’d take a moment and explain a few things that will still be misinterpreted as fodder for drama. You know, because, Second Life. I use the Dance Queens calendar as a source. I only include groups that send in notices to Dance Queens before press time. If a group sends a notice after press time or does not send a notice at all, I do not include them. However, they’re more than welcome to add their event in the comments of this post. Nice groups send their notices early. Awwwwwww nice! I love on you! Naughty groups dilly-dally and send them in late. Naughty group! Naughty! And, yes, that calendar URL is new. I’ve been working on a Google Sheet, Form, Script, and Calendar to help migrate Dance Queens from an old, unreliable calendar platform to Google Calendar. This will let people add the calendar to their Google desktop or another scheduling platform that takes iCal or other compatible formats. 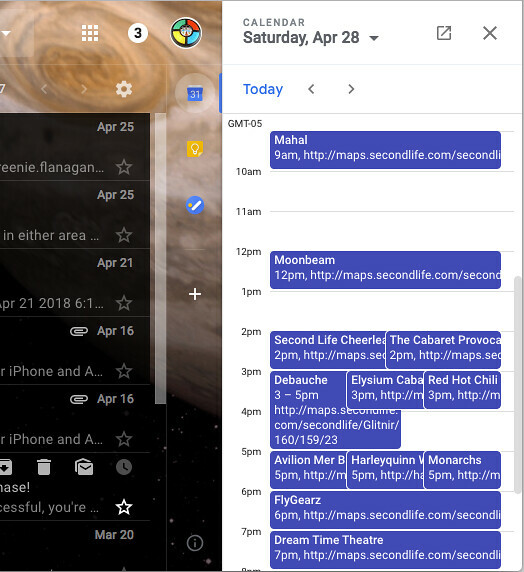 Heck, you can even put the Google calendar on your margin in Gmail, even better! I am a member of two dance troupes: Guerilla Burlesque and Debauche. I feel that both are excellent groups and put on a great show. I would not have joined them if they didn’t. It would be unfair for me to promote them above others, but, f- it. See them both. There, I said it. 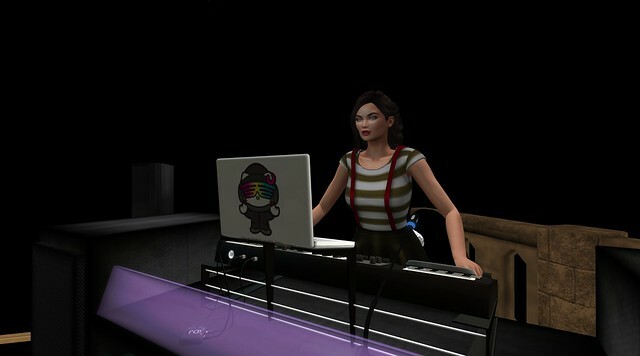 I am also an officer with Dance Queens, which promotes dance performance in Second Life through various ways. I like to see it as an efficient way to broadcast and receive announcements without having to be in eleventy billion groups. Or should I just shut the hell up and let you go on about your lives? I mean, I can just post the calendar link and say “Add it or not, no demo skin off of my mesh head’s nose.” right?